This fall marks the fifth anniversary of our Displayloc suction cup beverage racks. But we were hardly the first innovators to use suction cup technology. In fact, there’s an entire online museum dedicated to the history of suction cups–which were used as medical devices for the majority of history. Here’s a look at how innovation and outside the box thinking led to one of the best retail merchandising tools of the modern era. Did you know suction cups have been around since as early as fourth century B.C.? Back then, suction cups were more important to medicine than today’s stethoscope. All thanks to the “cupping” procedure, in which suction cups made out of gourds were attached to the skin and used to draw “bad blood” away from diseased organs as an alternative to bloodletting. The procedure was credited to Hippocrates, the first medical doctor. So how did these medical devices end up being used at retail? It’s all thanks to some innovative thinking by W. H. Jones and C. L. Middleton, who were granted a patent for the first retail display with suction cups in 1882. They used suction cups to display letters, cards and photographs. 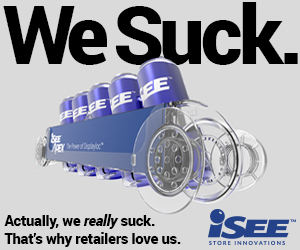 iSEE’s no-fail APEX Vault suction cup beverage rack is a direct descendant of the innovation led by Jones and Middleton. While developing a suction cup that holds beverages was hardly a new concept when APEX launched, the iSEE team made it work better by outside the box thinking and repurposing vacuum seal technology used in other industries to make a cooler door suction rack that actually works—at the request of a supplier partner who was tired of getting turned down by retailers that didn’t want to dedicate cold vault space to suction cup racks that would just fall down. The APEX Vault suction cup beverage rack is just one example of this process. Who knows what’s in store for 2019!